Publication History: Originally published in the Proceedings of 1992 and 1993 International Conferences on Outdoor Recreation. Citation: Watters, R. (1996). A computerized cataloging system for an outdoor program library or resource center . In Joyce, P. & Watters, R. (Eds.). Proceedings of 1992 and 1993 International Conferences on Outdoor Recreation (pp. 13-25). Pocatello, ID: Idaho State University Press. Editor's Note: There have been great advances in software and software programming languages since this paper was written in the mid 1990's. The software program described within is very much old-style. However, some users may find the descriptive information on the program's features and flow of logic helpful as they design their own software for small libraries. Recently, we made a major update to the program using dBase's latest object oriented language, and it now has a much more contemporary feel and interface. We would be happy to provide this new program's source code to non-profits at no cost, but in order to make use of it, you would need to purchase a copy of dBase Plus. This paper explores a computerized system of cataloging materials for small to medium sized outdoor recreation resource centers. Free to non-profit organizations, the software described in the paper is designed to create and manage a database of books, videos, impact statements and other resource materials. Among other functions, the software will produce files which can be used by a word processor to print cards for a card catalog, and it can be used to make rapid word searches to find needed materials. Many Outdoor Programs maintain outdoor resource libraries. Included in the library may be books, environmental impact statements, videos, periodicals, and other materials. As more items are accumulated, it becomes more and more difficult for users and staff members to know what is available and where it is located. A cataloging system can solve the problem. Moreover, a computerized cataloging system is particularly effective, allowing users to do rapid word searches to find needed resource materials. This paper summarizes a free software program which can be utilized by outdoor recreational programs to manage materials in their outdoor resource library. The program, entitled the Outdoor Resource Library Cataloging System (ORLCS), is designed primarily for outdoor programs with small to medium book, periodical and video collections. Using the software, a database of library materials is constructed. Once in the database, materials can be easily located by author, title, call number, or subject area. Users can find materials by searching with a key word. For instance, a user can enter the word "compass" and all materials in the database that include "compass" in the description will be listed. The software can also be used to prepare a file for your word processor to print Roldex or index cards for a card catalog. The program is free to non-profit organizations and agencies. Those interested in obtaining a copy, should send a blank formatted disk and a self addressed, stamped computer disk mailer to ISU Outdoor Program, Box 8118, ISU, Pocatello, ID. 83209. It is one of two free programs that are available from Idaho State. The other program is a participant database system which can be used for preparing mailings and keeping demographic information on participants. A paper describing the participant program can be found in the Proceedings for the 1992 International Conference on Outdoor Recreation available from the Outdoor Recreation Centre at the University of Calgary. Information on a third program will be available at a future conference. The program is built upon the Dbase IV language which has long been a standard among database software applications available for IBM compatible computers. One of the advantages of building a program like the Outdoor Resource Library System on the Dbase language, is that it allows you the flexibility and the ability to customize. If desired, you can change the program and add new categories to the database entry form or alter functions so the software better addresses your needs. Dbase can also be used to set up other databases useful in outdoor programs. You can keep information on participants, set up mailing lists, or record sales information. Consistently ranked among the top three or four commercial databases, Dbase provides a wide range of features. Unfortunately, it is not free. But college and universities can obtain an "academic version" of Dbase for around $200, a considerable saving over its normal retail price of $795. If you are not part of a college program, there's another option. Do some shopping around by paging through the ads in the current issue of PC Magazine. With a little research, you can usually end up paying far less than the advertised retail price. To run Dbase IV, you need an IBM compatible computer with at least 4 megabytes of room available on your hard drive. A 286 machine will run the program but 386 or 486 machines are much snappier. The call numbering system used by ORLCS consists of a two-place designator: a letter and a number. An example of a call number is "S31." The letter represents an activity area: "S" for snow related activities (skiing, winter camping, snowshoeing), "W" for water related activities (rafting, kayaking, sail boarding, etc. ), "H" for hiking and backpacking, and so on. The call number is simply the number of the book as it was added to the library. The first book purchased in the Hiking Subject area is "H1," the second book purchased is "H2" and so on. This is a simple system which can be easily understood by your users and staff. It is also handy when doing an inventory of your library and looking for missing books. All that is necessary is to quickly scan the spines of the books in the library, looking for a gap in the numbers. Finding missing books is far more difficult when using other types of cataloging systems. Moreover, other library systems often place similar outdoor books in categories that may be located in different areas. 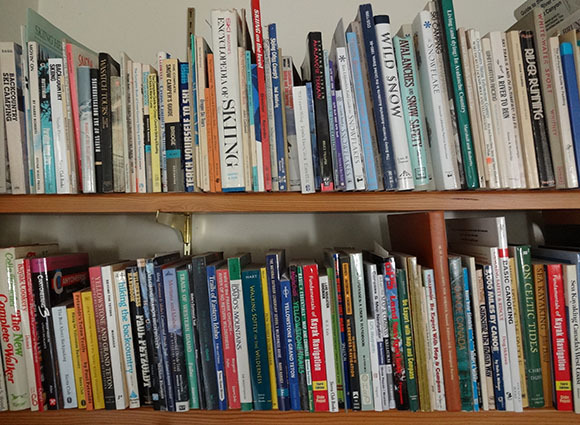 For instance, under the Library of Congress system some mountaineering books may go in a geography area, others may be placed in a biography area and still others may be placed in a physical activity section. One of the interesting pieces of the information to come out of the 1993 International Conference on Outdoor Recreation was that systems similar to that described above — or adaptations of it — have been developed independently and are being used by several outdoor programs. Shanna Lee Tarter of Cornell University has devised a well thought out cataloging system which consists of a three-place designator. The system includes a "type" designator in additional to activity area and book number. Within each activity area, Shanna Lee places books into one of three types: literature (biography, history, fiction), guides (where to go), or technique ("How To" books). An example of a book cataloged under their call system is "W Lit 4." This system has all the advantages of the one described above with the additional convenience of having all literature, guide books and technique books all located on the same area of the book shelf. The ORCLS uses the two-place designator system of a letter and a number. However, the software can be modified to include Cornell's "type" designator. To start the program you must have Dbase IV installed on your computer. You also must have copied the ORLCS files to your hard drive. Start Dbase IV by typing the word "DBASE" at your computer's prompt. The opening menu in Dbase will appear on the screen. From the opening menu, you need to move to something in Dbase called the Dot Prompt. The way to reach the Dot Prompt is to press ALT-E (Exit) to activate the "Exit" pull down menu, and move the highlight so that "Exit to Dot Prompt" is selected and press ENTER A dot will appear on the screen with the cursor flashing beside it. This is Dbase's Dot Prompt. At the Dot Prompt, type in "DO CARD," and ORLCS will start. Everything begins and ends here. If you want to enter information on a new book, you would select "Add a Book to the New Books List." If you want to search by a subject, you would select "Find Books Through Subject List." To select a function, use the UP and DOWN arrows keys on the keyboard to move the highlight up and down the list — or you can press the first letter of the item. For instance, pressing "S" will activate the function, "Search Master List." To understand the Main Menu, it is helpful to define two terms: Master List and New Book List. The "Master List" is the most important. It is a file that contains information on all the books, periodicals and videos in your library. The "New Book List" is a smaller file which stores information on new materials. It acts as a temporary storage area for new books until you have entered enough to make out index or Roldex cards for your card catalog. Once the cards are made, you can move the books from the New Book List to the Master List. Add Books to New Book List. You start here when first setting up your own database. A form appears on the screen with the author's name, title, publisher, copyright and other descriptive information. (The form is illustrated on the next page). On the form, you enter information on each material in your library. Edit Information on New Books List. If, while you are working with new books, you need to make corrections on any of the entries, choose this function. It allows you to page through the new books, stopping where needed to make changes. Make Subject Cards from New Books List. Once you are finished adding new books or other materials, select this function. This will make a file containing all the information on materials on the New Book List. The file then can be imported into your word processor to make author, title and subject cards. Prepare a Printed Copy of the Master List. This function allows you to sort and print the Master List. First, you can select how you wish to order the Master List: author, title, or call number. When the list is sorted, a file will be created that you can import in your word processor. Once in your word program, you can select fonts, format the list to your liking, and print it. Create Subject Cards from Master List. This function will allow you to make cards for your card catalog from the Master List. From a list of all your materials that appear on the screen, you check the ones you need cards for. After you have made the selections, the program will create a file which can be imported in your word processor to make the printed cards. Transfer New Book List to Master List. When you are finished making cards from the New Book List, this function will move all the new materials to the Master List. The New Book List will be emptied and readied for more entries. List or Edit Master List. If desired, you can view the Master List on your computer monitor. Before viewing, you can select how you want the books and materials ordered (author, call number or title). You can also select the format in which the material is displayed: by a card format which is an electronic version of a printed card from the card catalog_or in a spreadsheet format in which the books, author, title, etc. are listed in columns and rows. Find Books Through Subject List. If you choose this function, a list of your subject areas will appear on the screen. (For a list of subjects, see "Work with Subject List" later in this paper.) Once you have chosen the desired subject, all books categorized under the subject will be listed. Search Master List. In this function, you enter a key word and the program searches through all descriptions for the word. For instance, if you enter the word "Backpack" any material with the word backpack in the description will be listed. Work with Subjects List. As you enter new books, you will be indicating one or more subject categories under which the book should be placed. For instance, Yvon Chouinard's book Climbing Ice, may be placed under the Mountaineering and Ice Climbing subject areas. If Mountaineering and Ice Climbing are not yet on the Subjects List, this function allows you to add them. When you choose "Add a Book to the New Books List," the form shown below appears. You can move from blank to blank on the form by pressing TAB or ENTER. The call letter (see list in the Call Numbering section, above) is entered in the top blank, "CALL." The next available call number is entered in the "CALLNO" blank. The blanks for "Author," "Publisher," "Place," and "Date" are all self explanatory. In the code blank, enter one or more subject codes. Each subject code is separated by one space and corresponds to a subject area in your card catalog. For instance, for the book, Rivers of the Southwest, the following codes may be used: RIV — Rivers, KAY — Kayaking, CNO — Canoeing, INT — Intermountain Area, NMX — New Mexico, COL — Colorado, and ARZ — Arizona. A card for Rivers of the Southwest would then be found in each subject area: Rivers, Kayaking, Canoeing, etc. A list of the subject codes is found later in this paper, under the heading, "Work with Subject List." After indicating the subject codes, count them and enter a number in the "Number of Codes" blank. This tells the program how many cards to make for the card catalog. On the last part of the form, a large space is available for the book description. You can reach this part of the form by TABBING to it and then pressing CTRL-HOME. The box turns into a miniature word processing program. You can insert words, delete, move sentences around, etc. If you are using small Roldex cards (2"x4"), make sure that you limit the description to not than 4 1/2 lines. If you plan to use larger cards, then you can enter more lines. The number of lines possible on larger cards will vary and you will have to experiment to determine the limit. After completing the description, you can type in a series of key words starting on line six and going to line 12. Key words are anything that would help a person find the book when a computer search is done. For instance, for the Rivers of the Southwest book mentioned above, on line six you may wish to type in the names of rivers covered by the book. One important thing to remember about the description is not to use any double quote marks ("). (Single quote marks are OK.) The reason for this has to do with how files are created for use by your word processor. Double quotes are used to separate the fields which correspond to the blanks on the form and any extra double quotes will confuse your word processing program, creating garbled information. When you choose the "Make Subject Cards from New Books List," ORLCS will create a file for your word processor. The file is named CARD.TXT. In computer parlance, the file is said to be "delimited with quotes." This means that each field within the file is placed between quotes and separated from one another by commas. Each separate book is separated by a carriage return. "C","1","Becky, Fred","Cascade Climbing","Mountaineers","Seattle","1989","MTR CAS","2","This is Fred Becky's guidebook of climbing in the Cascades." "C","2","March, Bill","Ice Climbing","Glen Publishing","London","1974","MTR ICE","2","A compact, all-around guide to the techniques of ice climbing." The delimited file is a very common way to moving database information from one program to another. The "Merge Letter" option of your word processor should be able to import CARD.TXT. Once you have made Roldex cards, your next step should be to move the New Book List to the Master List. This is easily done by selecting the "Transfer" function on the Main Menu. All the records in the New Book List will be emptied and moved to the Master List. Display Master List (No Editing). This allows you to review the list, but won't let you make changes. The option has been included for non-staff users of the program to page through the listing of the books. By having users select the "No editing" option, you won't have to worry about anyone accidently changing any information. You can go to a specific book, by pressing ALT-G which activates the GO-TO menu on top of computer screen. Press I for Index Search and you can search for an author if you are in an author listing or you can search for a title if you are in a title listing. Once you have located the desired book, you can make any corrections needed. You can go to a specific book, by pressing ALT-G which activates the GO-TO menu. Press I for Index Search and you can search for an author if you are in an author listing or you can search for a title if you are in a title listing. Once you have located the desired book, you can make any corrections needed. This is a list of all of the subjects that you have in your subject card catalog. They correspond to the codes that you have included on each book's entry form. You can page through the subjects by pressing the Page-Down key on your keyboard. You may also press a letter, i.e. pressing "W" will move you to all subjects beginning with the letter "W."
After you have selected the desired subject, the first book classified under that subject will appear on the screen. By pressing Page Down, each subsequent book under the chosen subject will appear. You can enter any word (or several words) in the blank. The program will then search for any instances of the word in book titles and descriptions. It will also search the words you have entered on line six through line 12 of the description. When it finds a match, the book's entry form will appear on the screen. By pressing Page Down, any other books that include the search word will also appear on the screen. As you make entries on books, you will enlarge your original list of subject categories. Any new subjects that you come up with need to be added to the subjects' file which is maintained by the ORLCS program. To make an addition, select "Work with Subject List" on the Main Menu. Page Down to the bottom of the screen and type in the subject code letter and topic. If needed, you can make corrections on any of the previously entered codes. When you exit from this function, any new codes will be sorted and placed in alphabetical order. Listed below are the codes and subject categories that we use for our library. You'll want to add others that are appropriate to your program. The ORLCS program is composed of a series of program files. Each of the program files can be identified by a .PRG extension. For example, when ORLCS starts, the Main Menu comes up. The Main Menu is found in CARD.PRG. If you want to make any changes to the Main Menu, they need to be made in CARD.PRG. Let's look at how you would make a very simple change in the Main Menu. One feature that you may wish to change is the title of the Main Menu. When you first obtain the program, the Main Menu's title is "OUTDOOR PROGRAM LIBRARY CATALOGING SYSTEM." The title can be easily changed to your organization's name. To do so, first start up your word processor and load CARD.PRG. (You can also use the editor built into Dbase. It is reached from the Dbase dot prompt by typing in: "MODIFY COMMAND CARD.PRG." For more information on the editor, see the Dbase manual. If you haven't done any programming, CARD.PRG won't make much sense. However, for the title change, you don't have to know how the Dbase language works. lc_heading = "OUTDOOR PROGRAM LIBRARY CATALOGING SYSTEM"
lc_heading = "IOWA STATE LIBRARY CATALOGING SYSTEM"
After the alteration is made, save CARD.PRG. If you are using a word processor, be sure to save it as "text" or "ASCII." Dbase can only work with text or ASCII files. Now start up the ORLCS program by typing in "DO CARD" at the Dot Prompt, and you'll see the new title on the Main Menu. If you wish to make other changes or add new features, you (or a computer aficionado involved in your program) will need to dabble with the Dbase language. The good thing about ORLCS is that it provides you with a start. You can use it as a template, keeping the features you like about it and adding new ones without re-inventing the wheel.